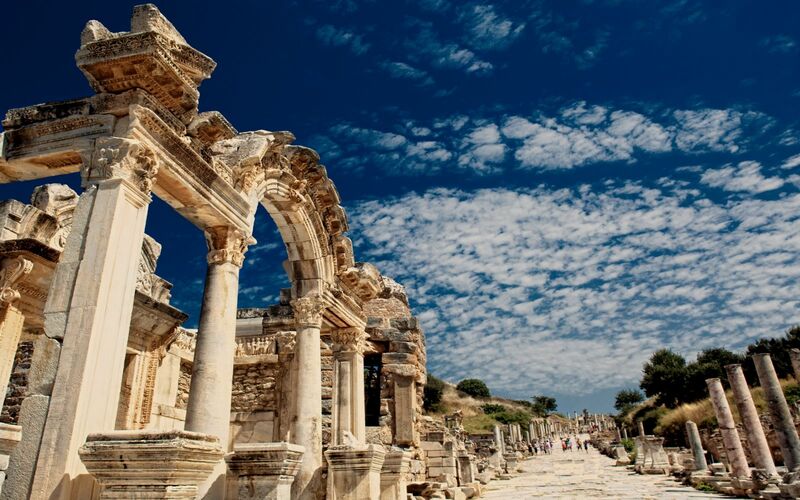 Ephesus and Pamukkale tour is a tour that takes 2 days to complete and includes 1 overnight stay at a luxurious place. In the first day we will take you to the 3000 years old ancient city of Ephesus, which is also a part of the "Seven Churches of Revelation". Take a chance to see St. John Basilica and the Temple of Diana, which is a part of the "Seven Wonders of the Ancient World". Take a look at the Museum, the Greco-Roman City of Ephesus, Marble Street, Odeon, Bouleterinon, Temple of Hadrian and Serapis, Agora, Library of Celcius, Great Theatre, Double Church, Arcadian Way and Gate of Magnesia. In the second day we will take you to Pamukkale (Cotton Castle) near Denizli. It is an amazing and unique natural place with hot spring waters which created an astonishing formation of pools and limestones.